This time of year, fantasy football owners are preparing their draft boards and tiers. 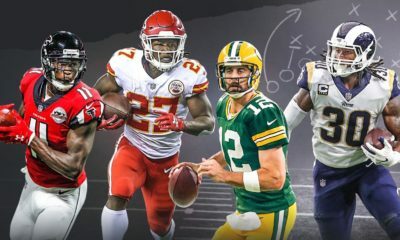 While the top backs and targets for NFL teams are almost all solidified, there are plenty of roles that are up for grabs. These are the fantasy relevant training camp battles for the NFC East. In this series, I am omitting players who are obvious starters; players like Dak Prescott, Saquon Barkley, Alshon Jeffery and Jamison Crowder. The Cowboys cut arguably their best WR (Dez Bryant) in the offseason, but not necessarily their leading receiver. Yes, he led the team in receiving yards last season, but that was not the case in 2015 and 2016. Those players are still on the roster in the form of Terrance Williams and Cole Beasley respectively. Beasley, especially, has impressed by lining up all over the field and not just in the slot. He is also running deep, not necessarily the type of routes that are indicative of his 10.4 career yards per catch average. There are also new Cowboy WRs competing in one of many training camp battles. Tavon Austin, Allen Hurns and Deonte Thompson were all signed as free agents. Austin, much like Beasley, has been known for running shorter routes. So far this year, Austin is executing deep plays, mainly go routes. Both Hurns and Thompson have missed time at camp, but have worked with the first-team offense when healthy. The Cowboys have had Hurns line up all over the field, almost as if they decided to make that a priority for their receivers. Austin and Hurns both saw work with the second-team offense during the first preseason game. There are young players making strides as well. Michael Gallup, drafted in the third round, and Lance Lenoir, UDFA from 2017, have both received first-team reps at times. In the Cowboys’ first preseason game, Gallup got the start (opposite Williams). The rookie rewarded Dallas with a 30-yard TD from Prescott on their opening drive. Lenoir also scored, while playing with the second-team offense. This is one of many training camp battles that is heating up. At this point, it is too close to call who will be the starters, but Beasley and Willams’ past rapport with Prescott certainly works in their favor. Knowing which tight end will start for the Cowboys could prove to be valuable, since the team ran just one play last season without one on the field, and that was a run. Geoff Swaim is currently listed atop the depth chart, but he is more of a blocking tight end, as shown by his two receptions last season despite getting snaps. He will likely continue this blocking role this season. So if we look past Swaim, we see three players with a combined one regular season appearance. That appearance belongs to Blake Jarwin, who has gotten a lot of first-team looks. 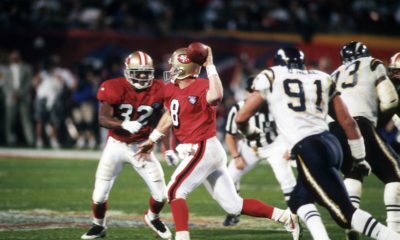 However, between fumbling the ball, and dropping passes in the end-zone, Jarwin was relegated to second-team duties at a certain point. Despite all of that, Cowboys reporter Marcus Mosher said on the FlurrySports Podcast that he still views him as the likely top fantasy Cowboys tight end. Rico Gathers, on the other hand, is missing out on opportunities because the coaching staff is still unhappy with his blocking and routes. When he does get a chance to show his skills, he still makes athletic plays. Jarwin, Gathers, and rookie Dalton Schultz each had at least one reception in the preseason opener. Jarwin had the most significant play of the three, as his 18-yard catch and run set up the Cowboys on the one-yard line in the second quarter. That being said, this is a fantasy situation that I would avoid until one of these pass catchers establishes themselves as the starter. The top four targets for Eli Manning are Saquan Barkley, Odell Beckham Jr., Evan Engram and Sterling Shepard. When the Giants are in their spread offense, that leaves one receiver spot on the field, behind Beckham and Shepard. It appears the Giants want Cody Latimer to get that job. He has certainly not disappointed at camp, working with the first-team and making plays downfield. The fact that he has also returned some punts all but solidifies his roster spot. Of the five other players that are mentioned here, Kalif Raymond has been arguably the most impressive. 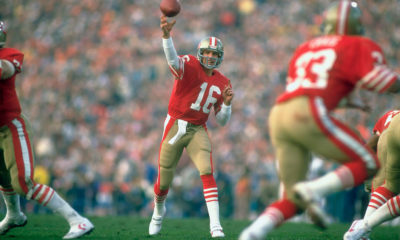 He made deep catches from both Manning as well as backup Davis Webb. He has also been lining up at different WR spots, and that versatility is important for players who are fighting to make the team. Unfortunately for Raymond, his contract is easy for the Giants to cut without salary cap ramifications. Working in his favor is the fact that Amba Etta-Tawo, Roger Lewis, Hunter Sharp and Russell Shepard all have contracts that are very easy for the Giants to get out from under. On the Giants first depth chart, Latimer and Sharp are the primary backups as well as the starting kickoff returner and punt returner respectively. Sharp was actually on the field in their opening drive of the preseason when Manning was playing. I believe the WR3 spot will belong to either Latimer or Sharp. Perhaps it will be a mix of both, but either player may be worth a late-round flier. Once Jay Ajayi joined in Eagles in the middle of last season, no RB ever got more than 50.7% of the offensive snaps. Considering how much the Eagles rotated RBs in 2017, it would be surprising for Ajayi to become a true workhorse. That means that the second and even third running backs have value in the Eagles system. 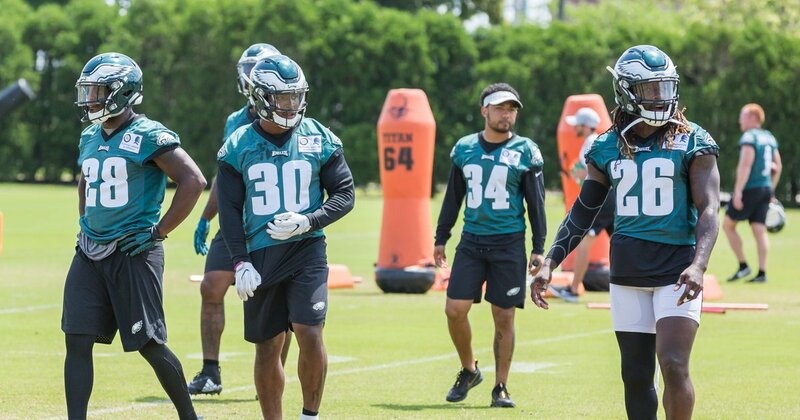 Corey Clement, Donnel Pumphrey, Wendall Smallwood and Daren Sproles have all seen time with the first-team in training camp. Clement, Pumphrey and Sproles are also working as pass catchers. The role of the Eagles third down RB could bring a decent amount of fantasy value and Sproles might have the inside track based on his experience. As expected, Ajayi started the preseason opener and Clement came in during the second drive. Three RBs caught two passes during the game (Clement, Smallwood and rookie Josh Adams) as Pumphery and Sproles did not play. With Ajayi, Clement and Sproles all likely to make the final team, the potential final RB spot may come down to pass protection. So far in camp, Smallwood has been good in pass protection. Perhaps that will allow him to make the team, as long as he avoids fumbles like the one during the first preseason game. If last year’s Eagles are any indication, the top three receivers will again be Zach Ertz, Alshon Jeffery and Nelson Agholor. Torrey Smith was fourth on the team in both receptions and receiving yards, therefore there is additional value to be had. With Smith gone, it opens to door for another receiver to take a starting spot. Mike Wallace was signed as a free agent and is the most likely candidate to take that spot. Wallace has similar deep ball skills to Smith, but is there another option? Head Coach Doug Pederson believes in a rotation early in these training camp battles. Shelton Gibson, Mack Hollins and Greg Ward have all seen first-team reps, as has Wallace. Carson Wentz has not been a full participant in practice, but he is getting in work with most of the WRs, including Rashard Davis and Markus Wheaton. Even Kamar Aiken is producing at times. All of this to say, that the competition is truly open. Arguably, the most impressive WR at camp has been Gibson. He has made some contested catches and has a knack for high pointing the ball. He also had a 63-yard TD in the preseason opener. If anyone will take the WR3 job away from Wallace, it will probably be Gibson. The Washington backfield looked set before training camp. However, with Chris Thompson still recovering from a broken fibula, and news that rookie RB Derrius Guice tore his ACL, things are now in flux. 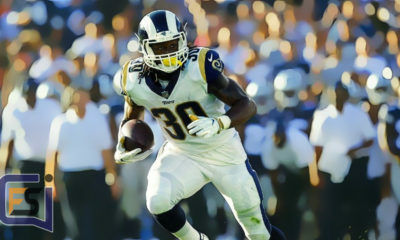 Thompson will make the team (they will lose cap space if they cut him) and he will resume his third down role. Two players competing for the early-down work entered 2016 and 2017 as supposed starters, Rob Kelly and Smaje Perine respectively. Neither was able to run away with the role, which is why Washington used a second-round pick on Guice. Both have had their fair share of first-team reps in camp and both have looked good in goal-line situations. Kelly is currently ahead of Perine on the Washington depth chart. Furthermore, Kelly got the start in the team’s preseason opener, while Perine didn’t see the field until the fourth drive. It appears that Kelly will get the first shot at being the lead back. The other RBs of note are Kapri Bibbs, who saw an increased workload last December and converted WR Byron Marshall. Both have seen first-team reps, and have gotten work as a receiving back, including during the preseason opener. Bibbs and Marshall have also worked on as kick return men, adding to their chances of making the final roster. If Thompson misses some games, there will be value for whoever takes over the third down role. The top three WRs are pretty much set. Outside of an injury or a horrible training camp Jamison Crowder, Josh Doctson and Paul Richardson will be the starting WRs. That probably leaves two or three roster spots for the rest of the WRs. Special teams will probably be very important for these WRs to make the final team. Robert Davis, Maurice Harris and Trey Quinn have each worked on kick returns. On the team’s first depth chart, Harris and Quinn were the backup kickoff and punt returners respectively. With a new QB on the team, establishing chemistry quickly will be important for WRs, especially Simmie Cobbs, Brian Quick and Cam Sims. All of them have had chances to work with Smith, whether it be in 1-on-1 situations or full team portions of camp. Those three will need to prove themselves as better receivers than the guys getting special team reps. Harris, for instance, was a second-team darling early in camp and was rewarded with some first-team reps.
My best guess would be that Maurice Harris is the closest to a lock to make the team. He got the starting nod and lead all of WRs in snaps during the first preseason game. If there is an injury to any of the starters, whoever steps in that role could bring value to fantasy owners.